Lady Washington is a full-scale replica of the first American vessel to explore the Pacific Northwest Coast. Lady Washington was build in Aberdeen Washington and launched on March 7, 1989 by the Grays Harbor Historical Seaport Authority. The original Lady Washington was built in the British Colony of Massachusetts in the 1750s and was named in honor of Martha Washington. The original Lady Washington sailed around Cape Horn and became the the first American vessel to make landfall on the west coast of North America. The original Lady Washington participated in the Maritime Fur Trade with the coastal Native Americans of the Pacific Northwest. The original Lady Washington was also the first American-flagged vessel to visit Honolulu, Japan and Hong Kong. The original Lady Washington was captained for a brief time by Robert Gray, the sea captain for whom the Grays Harbor area was named. Lady Washington has been named "Washington State's Tall Ship Ambassador", as well as the official State Ship. Lady Washington is a type of sailing ship commonly known as a brig, which is a sailing vessel with two square-rigged masts. Lady Washington appeared in the film Star Trek Generations in 1994 as the brig Enterprise. Lady Washington appeared in the film Pirates of the Caribbean : The Curse of the Black Pearl in 2003 portraying the HMS Interceptor. Lady Washington regularly sails to ports around the Puget Sound providing educational experiences about the maritime history of Grays Harbor, the Pacific Northwest. • 1986 – Grays Harbor Historical Seaport Authority chartered by the City of Aberdeen, WA. • 1987 – Keel laid for Lady Washington on September 13. • 1989 – Launched into the Wishkah River on March 7. • 1989 – In May and June, conducts first tour of Puget Sound ports: Port Angeles, Port Townsend, Seattle, Tacoma, Olympia, Gig Harbor, Port Orchard, Bremerton, Everett, Anacortes, Bellingham, and Friday Harbor. • 1989 – Lady Washington at home port of Aberdeen during July. • 1989 – In August and September, first tour of Columbia River ports, including Portland. • 1991 – First trip to Canada, including ports of Sooke, BC, and Vancouver, BC. • 1993 – First trip to California; first mock sea battle with Hawaiian Chieftain; makes movie debut in Star Trek: Generations. • 1998 – First sailing partnership with Hawaiian Chieftain, which was later purchased by GHHSA. • 2003 – Sails to Caribbean for filming of Pirates of the Caribbean: The Curse of the Black Pearl. • 2005 – Lady Washington participates in cultural healing ceremony on Clayoquot Sound in Vancouver Island with the Tla-o-qui-aht First Nation and the descendents of Robert Gray, master of the original Lady Washington. 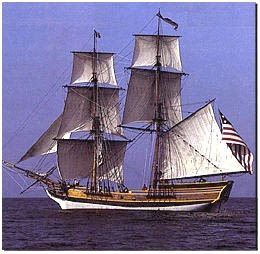 • 2005 – GHHSA purchases Hawaiian Chieftain, which becomes Lady Washington’s companion ship. •	2009 – 20th anniversary of Lady Washington’s launch on March 7. The Lady Washington sails with her sister ship the Hawaiian Chieftain and can be seen at many ports around Puget Sound. The ships and crews provide educational, vocational, recreational, and ambassadorial activities and experiences that promote and preserve the maritime history of Grays Harbor, the Pacific Northwest, and our nation while serving the needs of the community. Visit the tall ships at one of their ports of call and explore the ships and hear tales of life at sea for an 18th-century sailor. Or schedule a sailing tour with the [Grays Harbor Historical Seaport Authority]. Several types of sailing adventures can be booked on the Lady Washington or the Hawaiian Chieftain including a three-hour cruise in which you're invited (but not required) to participate in the operation of an 18th-century tall ship. You'll raise sails, take the helm, and hear stories of how ships explored the west coast of North America or experience a mock sea “battle” with small cannon and intricate maneuvering. Longer sailing tours on the tall ships are also possible during the summer months which include a five-day expedition voyage around the beautiful San Juan Islands. Lady Washington, In The Wind! This page was last modified on 23 May 2010, at 09:56.